Epiphany (Timket) was colorfully celebrated nationwide Today 19 January. The religious observance here in the capital in which thousands of the faithful took part also witnessed a night long prayer. 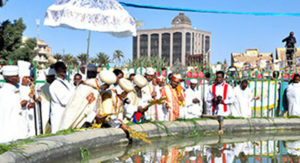 The observance conducted in the morning hours of today at the Epiphany Holy Water spot was headed by Abune Lukas, Secretary of the Holy Synod of the Eritrean Orthodox Tewahdo Church and several religious leaders attended. Dr. Nuguse Legese, member of the World Churches Council and head of African Affairs as well as several government officials and thousands of the faithful took part in the celebration.